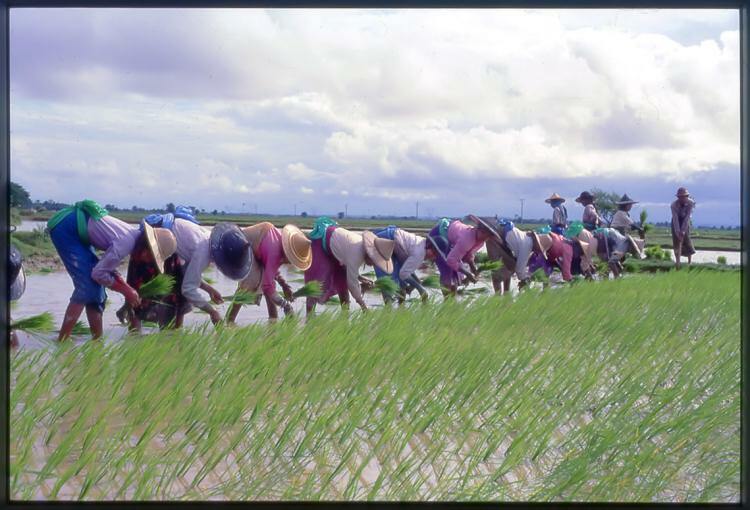 “Monsoon Asia” is an Asia region under monsoon climate, which has rice farming as a basis for food production. Agriculture in the Monsoon Asia is very diverse from north to south, while the monsoon Asian countries are all characterized by high biodiversity around rice fields. These countries are also all confronted with environmental deterioration in agro-ecosystem. This problem may be caused by the change in land use as economical development and as population growth, the invasion of alien species due to globalization of trade, and the contamination of farmlands by chemical pollutants from industries. Furthermore, there is a great concern that the agricultural ecosystem could collapse due to global warming, and another concern that the agricultural activities themselves cause environmental pollution such as water pollution with excess chemical fertilizers and pesticides, generation of green house gases such as methane and nitrous oxide from farmlands. To solve these issues, researchers in the region should collaborate to tackle against them. Therefore, NIAES held the international symposium entitled “Evaluation and Effective Use of Environmental Resources for Sustainable Agriculture in Monsoon Asia: Toward International Research Collaboration”, 12-14 December, 2006. At this symposium, all participants agreed to adopt the Symposium Statement. The 276 participants from 15 countries in the international symposium “Evaluation and Effective Use of Environmental Resources for Sustainable Agriculture in Monsoon Asia -Toward International Research Collaboration”, hosted by the National Institute for Agro-Environmental Sciences (NIAES) and supported by the Agriculture, Forestry and Fisheries Research Council of the Ministry of Agriculture, Forestry and Fisheries, hereby confirm and agree upon the following points by consensus. In monsoon Asia it is urgent that we solve environmental problems affecting agriculture in order to achieve sustainable development while maintaining a sound agro-ecosystem. Solving these problems requires that researchers, administrative authorities, research institutes, and other entities connected with agriculture and the environment in the countries of this region make a concerted effort under close collaboration. For that purpose, we shall create the Monsoon Asia Agro-Environmental Research Consortium, which transcends the boundaries of specialization and countries, and conduct agro-environmental research through international collaboration under the consortium. Based upon the Symposium Statement, NIAES will pursue the following activities for the purpose of conducting research under the Monsoon Asia Agro-Environmental Research Consortium (MARCO). Regularly provide venues for events such as international symposia for exchanging research information. Provide a website as a venue for exchanging consortium information. Help train the people who will carry on activities under the consortium. The mission of MARCO is to promote the development of agro-environmental research in Monsoon Asia in order to achieve sustainable development of agriculture while maintaining the sound agro-ecosystem. To improve the knowledge on agro-environment and ecosystem services. To develop technologies, standards, and monitoring systems in order to maintain the sound agro-ecosystem and to conserve environmental resources. To develop technologies for and their applicability to the preservation and re-establishment of environmental balances. To foster collaborative research on agro-environment under the Consortium. To exchange research information for sharing advanced knowledge on agro-environment. To make concerted efforts under close collaboration for solving agro-environmental problems. To achieve the objectives, MARCO shall design the following activities. To organize, sponsor, and co-sponsor seminars, workshops, symposia, and conferences oriented to the objectives of the Consortium. To promote exchanges with professionals through the Consortium. To provide a website as a venue for exchanging information on the Consortium. To help train personnel who will carry on activities under the Consortium. To establish relationships with international organizations whose activities are common to those of the Consortium. To strengthen the network among research organizations in the Asian monsoon region whose objectives fall in the domain of those of the Consortium. MARCO is a flexible research collaboration network to facilitate international collaboration for agro-environmental research in Monsoon Asia region. We would like to invite research organizations which wish to collaborate under the framework of MARCO. Please contact us.